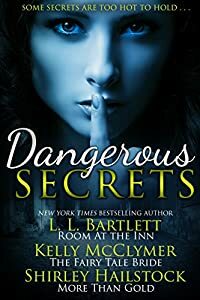 SECRETS...become lies...become novels by three stellar writers. Find out what SECRETS they can tell. New York Times Bestselling Author L.L. Bartlett presents ROOM AT THE INN, A Jeff Resnick Novel. Burdened by a powerful sixth sense, inflicted by a car accident, Jeff's feeling of impending doom is not soothed by the atmosphere of a charming B&B. When a body in found in the hot tub, it seems Jeff's unwanted psychic powers are growing stronger. If only they could detect the murderer before Jeff and his girlfriend become the next victims. What dark secrets lurk beneath the romantic façade of this historic inn? Author Kelly McClymer offers a tale of love gone astray in THE FAIRY TALE BRIDE. The Duke of Kerstone and sweet Miranda Fenster were destined to marry when a plausible lie drove them apart. Five years later, another secret forces them to marry at once. Miranda's one chance for happiness will be ruined before it begins if she cannot uncover the truths that her noble husband's family is hiding. Multiple-award winning author Shirley Hailstock brings together a story of international intrigue and a tender story of lost love that is MORE THAN GOLD. Morgan Kirkwood won Olympic Gold in Seoul but her real goal to take part in a rescue mission in the secretive North with the help of 'swimming coach' Jack Temple. The passion they ignited on that journey was kept dead secret. But now the past has come back into her life...and so have her feelings for Jack. All Jack wants is to get out of the CIA until he realizes that Morgan is in danger and only the truth can save them.